Located on de la Gauchetière Street with 900 sq. ft. This 1-bed 1-bath loft features exposed concrete, factory-style fenestration and 11 ft. ceilings. Building amenities include ground-floor bistro, courtyard garden and indoor parking. 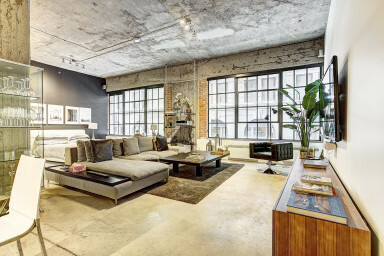 Beautifully capturing the industrial charm of its historical location, this fully-furnished NY style loft truly embodies the urban lifestyle. Exposed raw materials like cement pillar, brick wall and sand-blasted concrete add great texture to the contemporary décor while the massive, factory-style windows gives plenty of natural light. The open-living concept, the wonderful sectional couch and 70’ flat screen television makes a comfortable den area, completed with a 6-person dining table that is great for entertaining. The fully-equipped, modern kitchen comes with European-style fitted cabinetry, large breakfast bar and a personal wine cooler. The spacious sleeping area includes a King-size bed as well as work desk and the designer bathroom features sleek subway tiling, Zen sink and a soaker tub. Simplissimmo’s stunning loft is perfect for your next stay in Montreal! Originally built in 1912 during the peak of the printing industry boom, The Unity 1 was masterfully restored into upscale residential lofts in 2001. Declared a historical landmark, the Unity 1 has carefully preserved its original architecture while delivering modern, urban design. Located on a quiet street facing the St-Patrick’s Basilica, residents will enjoy the chic, ground-floor Daylight Factory bistro, shared interior courtyard garden and included indoor parking. Serviced by the Square-Victoria metro station, the International District’s ideal location between the downtown core and Old Montreal means great access to all the city has to offer. Formerly known as Paper Hill, this area is a heritage site protected by St-Patrick’s Basilica. Now surrounded by Montreal’s major banks and trading centres, residents find themselves in an architecturally rich environment. The colourful Palais des Congrès gives access to the Underground City that connects to the Central Station, Place Bonaventure and more! Grab a bite to eat at local restaurant like Miss Prêt à Manger or take a stroll in nearby Chinatown. With something for everyone, this sophisticated neighbourhood is sure to impress!